My Time at Portia has swallowed me whole. Now that it’s out on PS4, Xbox One, and Switch (can I get a hallelujah?) when I’m not running around taking commissions from the local commerce guild I’m checking how well my little workshop ranks against Portia’s accomplished builders, or fighting and puzzling my way through ruins to get some sweet, sweet loot that’ll let me craft more machines, which I’ll use to craft more objects, to craft more machines… and so on and so forth. Yes, there’s a lot to keep track of in My Time at Portia, but it never feels overwhelming at all thanks to a friendly mission management system, a core storyline, and lively NPCs who make Portia into much more than a building/mining/crafting simulator. After having wrung similar games like Stardew Valley dry, Portia has sated my appetite for a substantial escape from reality with the added bonus of making me feel part of its wholesome little world, multi-coloured llamas and all. Basically, it’s very almost perfect. 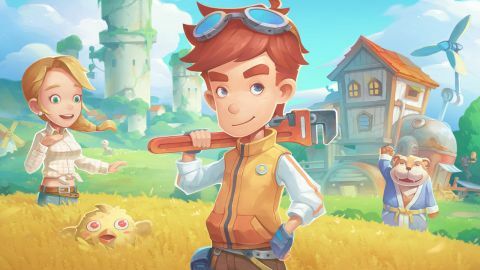 My Time at Portia’s premise will be familiar to anyone who’s played Stardew Valley, Harvest Moon, or Animal Crossing: you arrive in a strange new town named Portia to inherit your father’s old building workshop, and spend your time restoring it to its former glory. That of course means that you end up helping out the good townsfolk of Portia by building everything from waterwheels to printing presses and then bam, in no time at all you’re absolutely indispensable. Some of your tasks will be got through commissions (requests posted in the commerce guild that you or competing builders can undertake) or quests, which are story-heavy and largely wholesome AF. The more commissions you do successfully, the higher your workshop rises in the local ranks, with the goal being to oust the slimy Higgins from the top slot. How you get the resources is up to you, making it ideal for any playstyle as you can buy them, mine them, or fight for them: there are abandoned ruins for you miners, trees if you’re not afraid of a bit of monotonous labour, or dungeons to battle through to get the rarer resources. If you’re more a social butterfly type you can also befriend the local citizens by giving gifts, sparring, playing rock, paper, scissors, or just chatting, which - if you play your cards right - can lead to marriage. And more importantly, someone to help on your growing farm. Speaking of socialising, there’s one area where other crafting simulators like Portia fail, but this game thrives: the story. Instead of relying on your own drive to craft the biggest, best stuff, the inhabitants of Portia routinely ask you for quest-related help, like crafting a boombox to get rid of some infesting Panbats (pandas + bats = panbats, and they’re adorable) or taking photos to publicise the local newspaper. As well as rounding out the NPCs so they’re not just another blank face giving you chores, the main storyline keeps developing the area around you, unlocking new sections and characters while keeping you and your invaluable help at the centre of it all. When you’re praised by Portia’s citizens you really do feel a glow of pride, as each new stage is just hard enough to give you a sense of accomplishment without feeling impossible. A large part of that is thanks to the nifty Handbook you have, which, as well as telling you the recipe for each item also hints at where to find it, so you’re not left trawling through wikis, a small feature that won’t take you long to appreciate the hell out of. Although the game has a few tiny flaws, like loading screens that are a touch too long and silent cutscenes, you’ll hardly notice them once you get into the swing of things. Even when you’re a good fifteen hours in things don’t get tiresome because, as you get more experienced, My Time at Portia actually grows with you. Complete a specific questline and a nearby shop will drop all the basic resources (wood, stone, etc) at your door (for a daily fee) to save you the tedious hassle of chopping trees for yourself, and you can even eventually commission the local police force to go ruin-diving for you to get those semi-rare resources that you simply don’t have time to farm. What that means is that when you need to build the really demanding stuff you’re not tripped up by the basic things, leaving you free to concentrate on finding that ultra-rare item. The TL;DR of this review? My Time at Portia has almost perfected the life-building simulator genre. By including memorable NPCs and a system that nurtures your every building whim, almost every little thing you tick off feels like a major accomplishment - and no, that’s not just because things sparkle when you finish building something. You’ll find yourself sucked into its world for hours on end, and I’m just warning you: you’re not going to want to leave it.